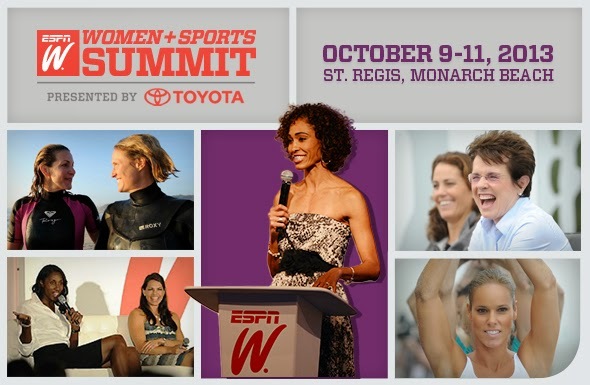 Girl is NOT a 4 Letter Word: espnW Summit. I'm off to the espnW Summit this week. I'm stoked to have been invited along with many other women (and a few men) that are heavily involved in the sports industry and who are all interested in making this industry a better place for females in every sport imaginable, from high school teams to the Olympics. Three whole days with inspiring people and also some rad action sports athletes you may already know of - like surfer Lakey Peterson, snowboarder Lindsey Jacobellis and skier Grete Eliassen. I have always felt that if we all pull together we can change women's sports for the better, and I think the espnW Summit is a great place to collectively work together on that! !